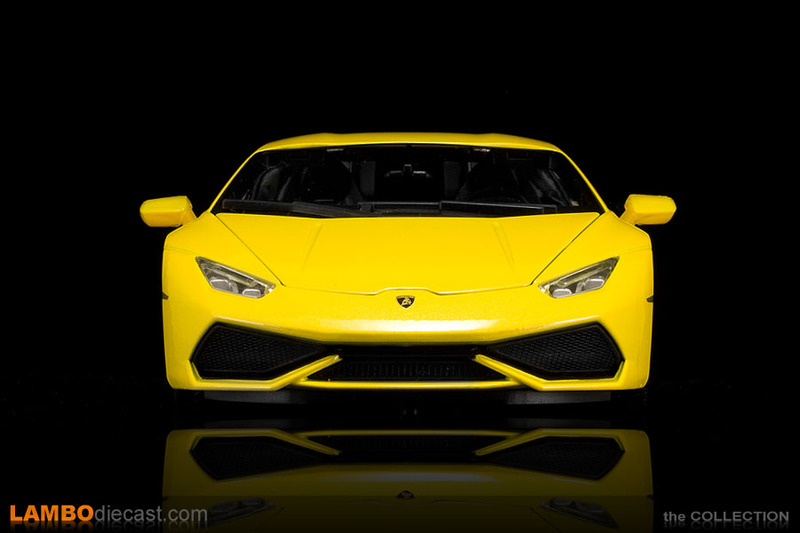 So I wasn't able to make it to the 2014 Geneva Auto Show this time, which really upset me to be honest as Automobili Lamborghini SpA was going to unveil one of their most important models at the show ... the long awaited successor to the Gallardo ... the Lamborghini Huracan LP610-4. 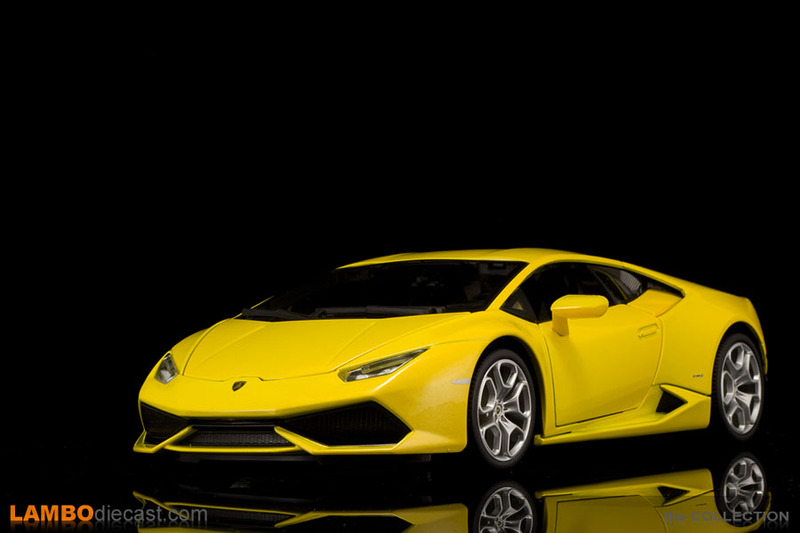 The first press day I see the photos of the new V10 on the stand ... one finished in yellow, another one in white and a third one in a very stylish looking grey metallic ... and a nice 1/18 model being offered in the official Lamborghini Store ... made by Bburago and available in green metallic, white and yellow metallic. 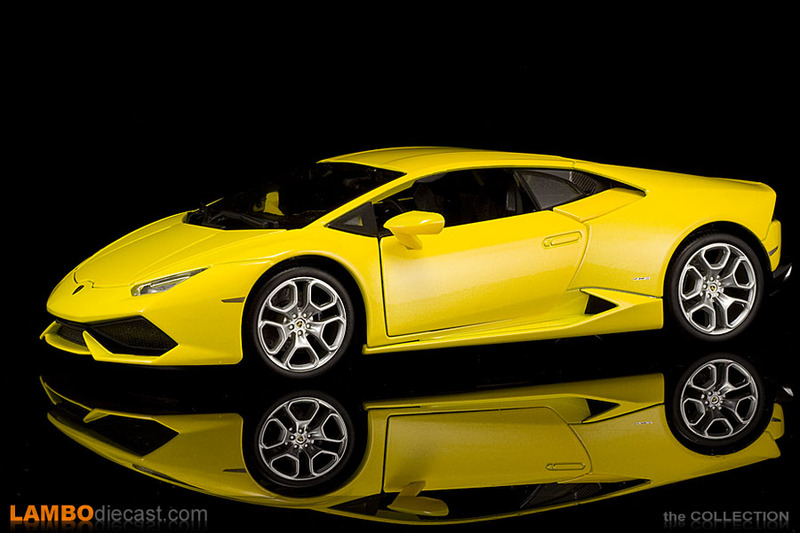 Feeling seriously bad about not being there I get a message from a good friend at the Lamborghini stand ... which shade would I like on the 1/18 Bburago model? Are you kidding? 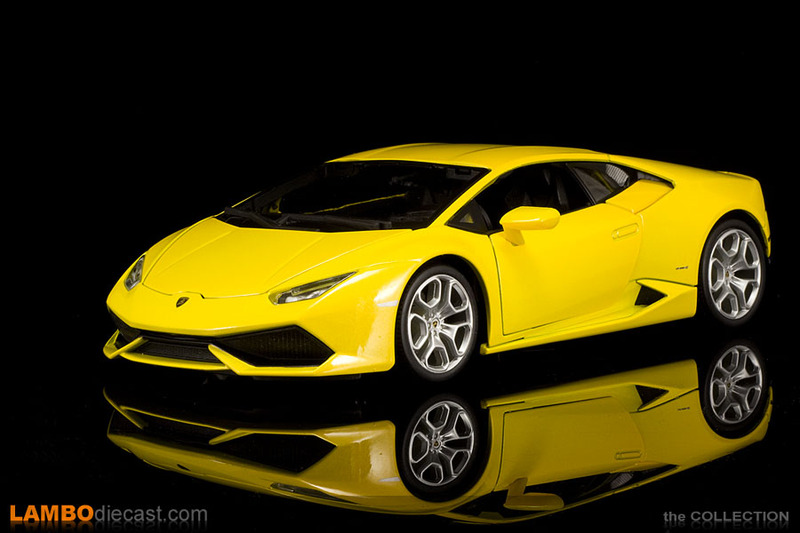 In fact he offered me one of these models totally for free while they were selling like hot cakes at the show ... actually the green one sold out the first day already I've been told ... however as the press kit showed a white car, but center stage in Geneva was taken by the yellow Huracan, I asked for the latter one. 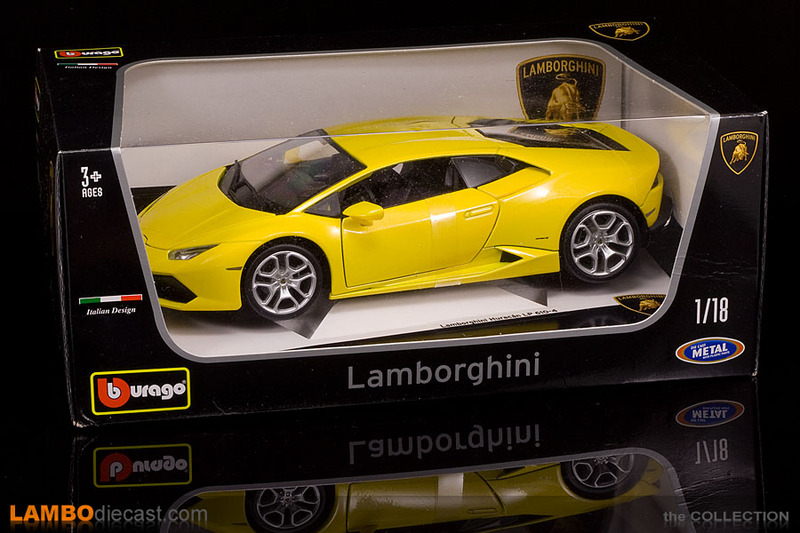 I was really excited to open the box once it arrived, I had seen the model being offered online, but the usual diecast shops all had it in 'pre-order' and the official Lamborghini Store didn't have any stock left ... so this 1/18 Huracan LP610-4 was already getting rare in a matter of days. 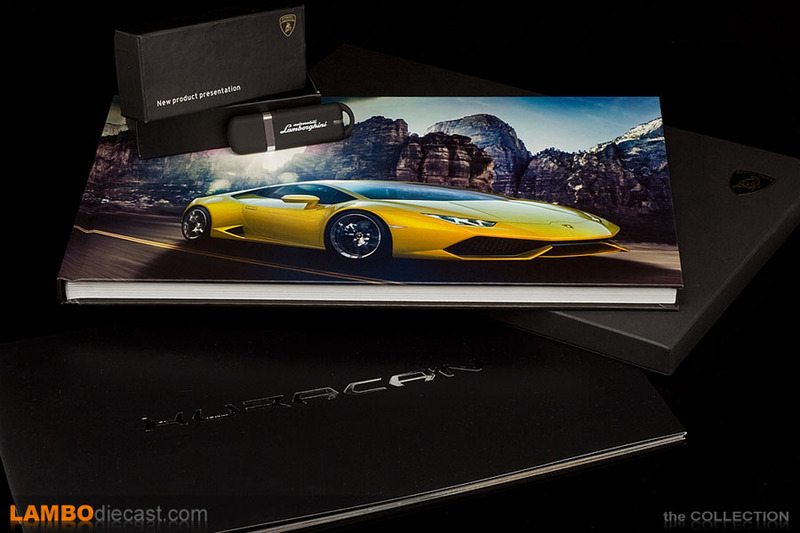 And things only got better when I opened the box ... not only did it contain this bright yellow metallic Lamborghini Huracan LP610-4 model, but my friend also included the extremely rare VIP hardcover brochure for the new V10, together with the softcover folder handed out to customers, the elusive USB stick normally only available to those that attended the preview events in January and a nice white bracelet that was handed out on the VIP evening event. So a massive surprize for me, those items went straight into a display case and will be treasured forever ... to be joined by the diecast model once I finished photographing it naturally ... so I took a lot of images from just about every angle possible, top, down, left, right, doors open, doors closed ... the usual ... so you can get a very good impression of the quality and details on this Bburago 1/18 scale model of the Lamborghini Huracan LP610-4. 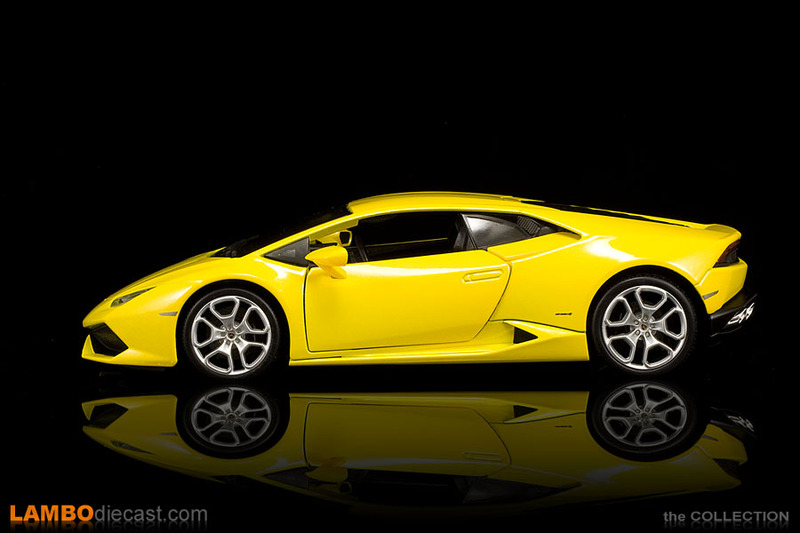 One thing that isn't exactly 1/18 scale is the rear wheel ... 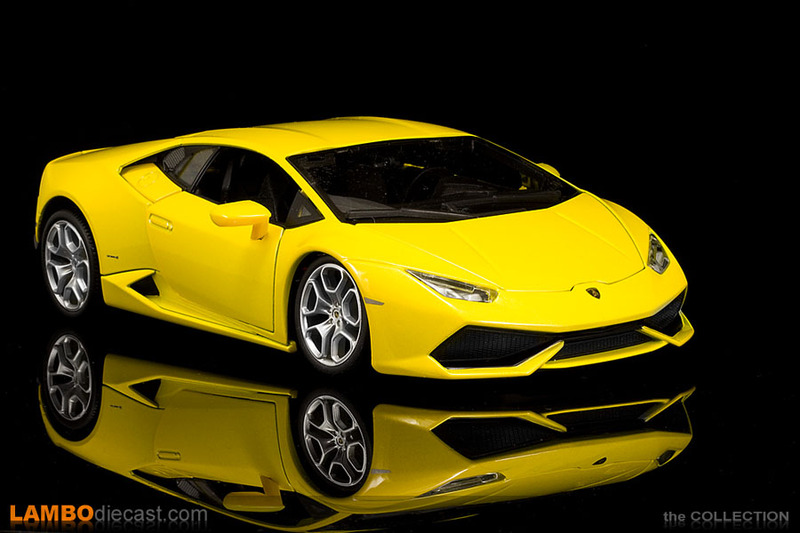 I measured it at 30.59mm which would scale up to a real life rim of 21.6 inch while the Huracan receives 8x20 and 11x20 inch front to rear, in fact the front wheel on the Bburago model measures 28.18mm ... which is exactly 20 inch in real life. 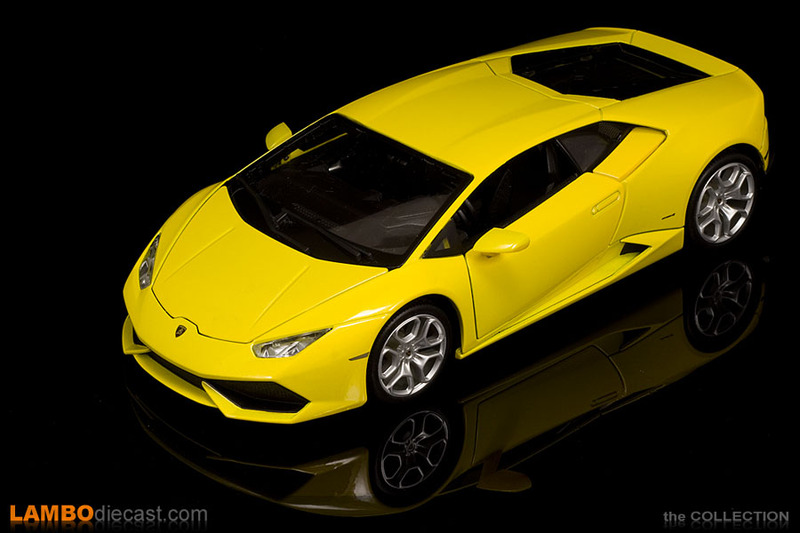 So how does this model stand up now that you know it is in fact a true 1/18 scale version of the real Lamborghini Huracan LP610-4? 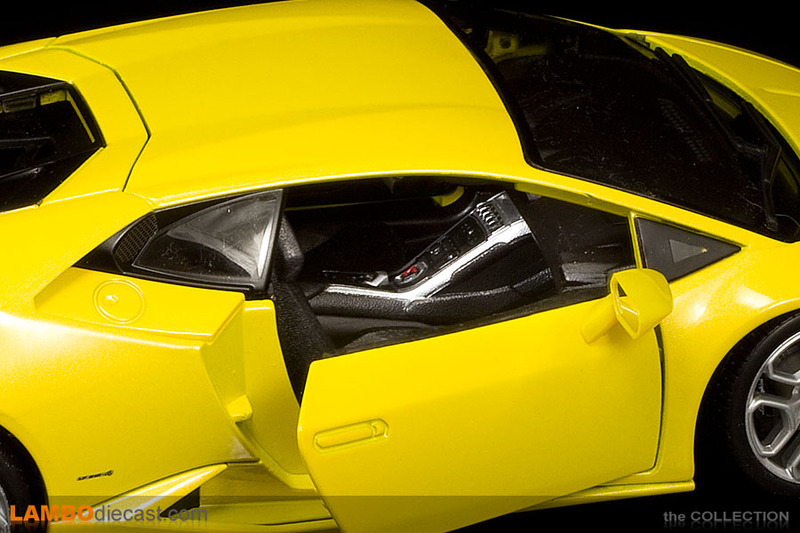 In fact the outside looks really nicely done, the hard corner on the door is there just like on the real car, the indents on the front hood are present too as are the 'bulbs' on the roof. 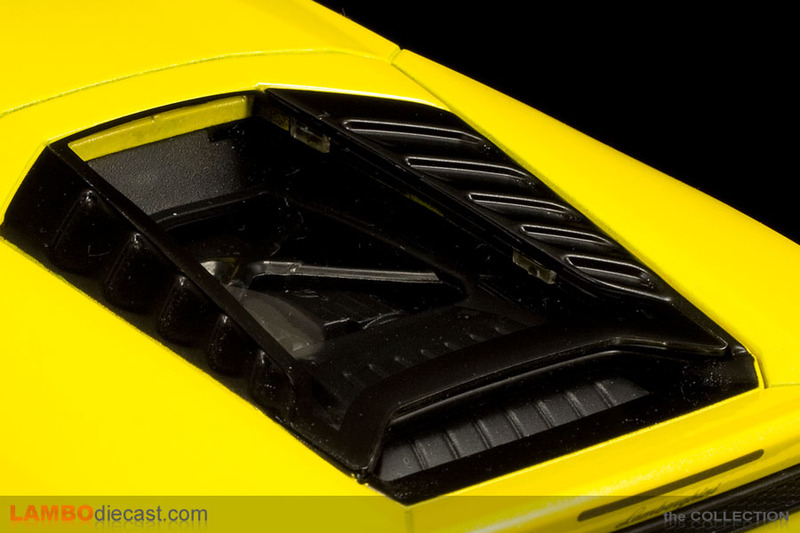 The Bburago model comes with the optional glass engine cover and features the vents along the side of the glass section, now in real life that would mean the engine bay is lined with Forged Composite ... on the Bburago model it is plain black plastic. 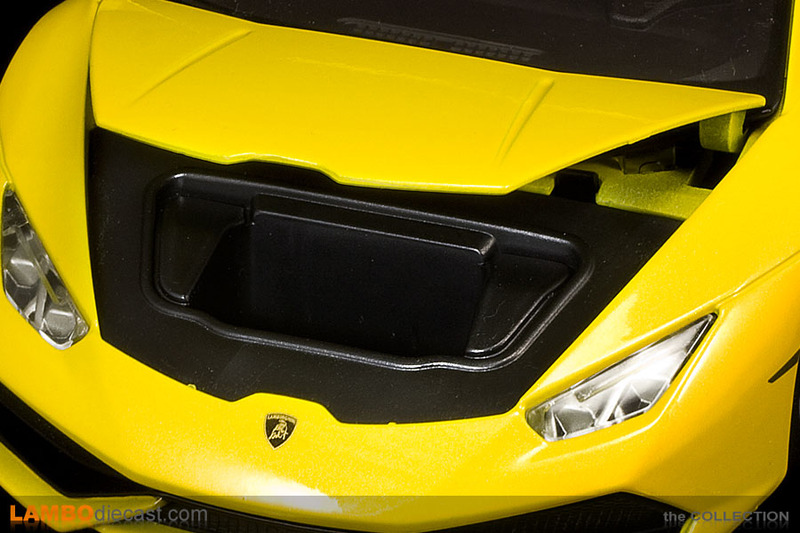 To be honest the detail on the engine is also rather poor, sure there is the Lamborghini script on the covers, but other than that it is all plain black plastic under the hood. 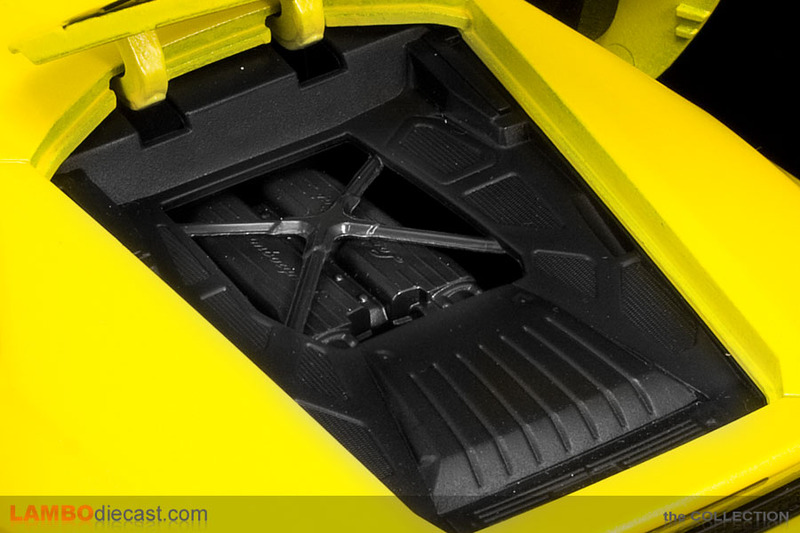 Up front the luggage compartment cover opens up too and shows the space that would probably take a set of bespoke, custom made luggage in real life ... Bburago made the section so that's a good point, however those amazing looking LED lights on the real Huracan just didn't make it onto this scale model ... which is a bit a shame as they are quickly becoming a trademark on this Baby Bull as the new Huracan doesn't feature a regular light bulb anywhere inside or outside ... all lights are LED units. The interior with the new dashboard and very special looking seats has been scaled down by Bburago too ... sure it has some rough edges, but keep in mind this is a diecast model that will probably be listed between €35 and €55 in the end ... so it isn't in the same league as a €250 AutoArt model or a €399 MR sealed model ... we're talking about a Bburago diecast model, so I'm not too worried about some of the details on this Huracan. 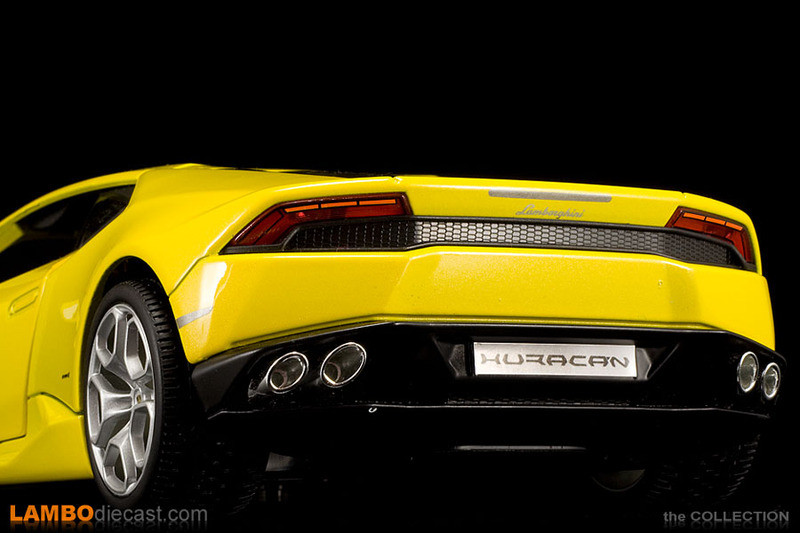 In fact I'm sure if I would apply some detailing to it this 1/18 Huracan would shape up very nicely, imagine a two tone yellow and black interior, shaved edges on the plastic, some carpet on the floor and painting the windshield surrounds black so no yellow is visible inside anymore ... and you'll end up with a very nice looking, custom scale model at a fraction of the cost of the AutoArt model, that will most likely take several months before even being announced. 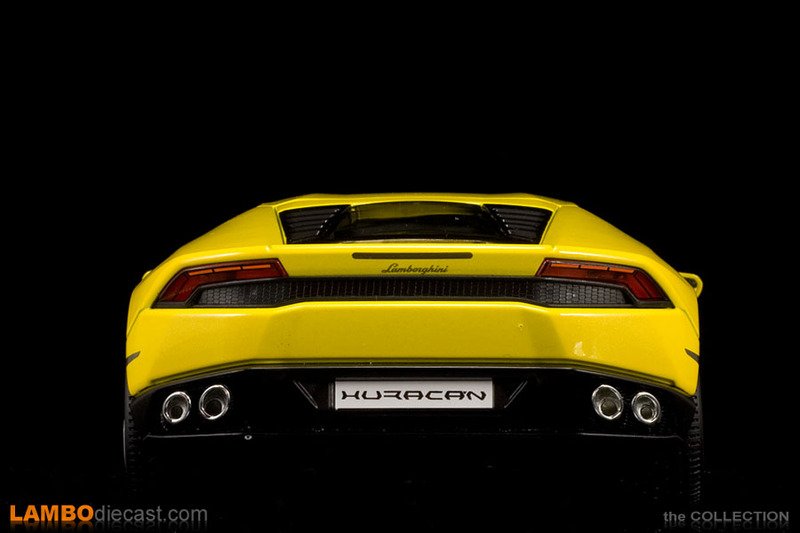 Despite the fact Bburago fitted larger wheels at the rear than at the front they actually look really nice ... on this Bburago model we are looking at the standard Giano wheels, the cars at the Geneva Auto Show all rolled on the optional Mimas wheels ... all are 20 inch tall but the Mimas wheels are lighter ... 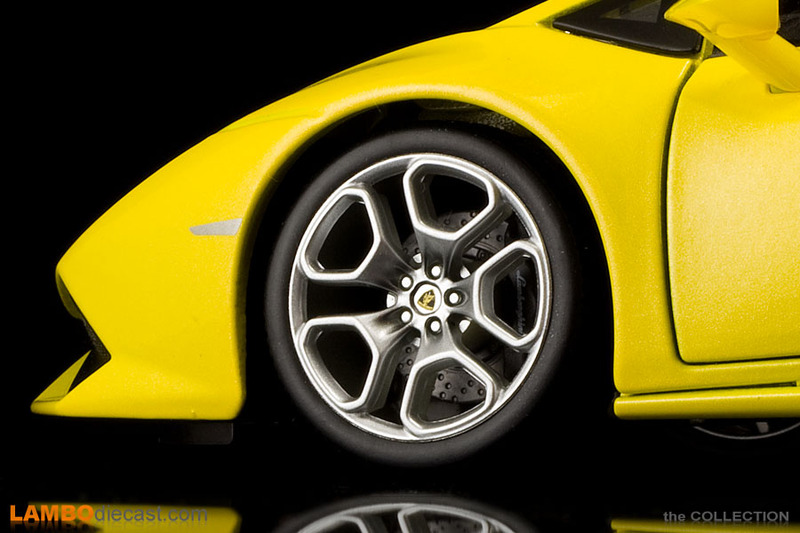 I for one rather like the standard Giano wheels, and Bburago did a good job in scaling them down in 1/18. Behind the wheels you'll notice disk brakes with a perforated 'look' and black brake calipers ... which in real life are an option, standard brake calipers on the Huracan are finished in silver. 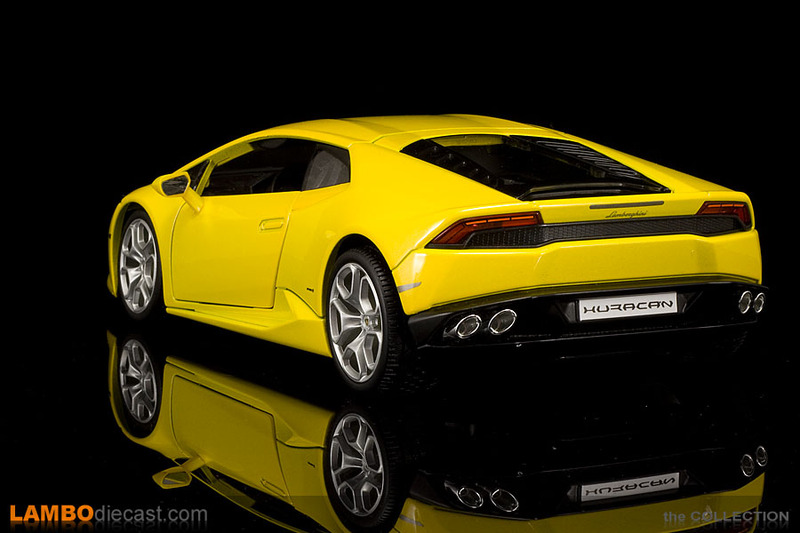 So I do think the wheels, disks and calipers look really good on the Huracan model, as do the large exhaust pipes. 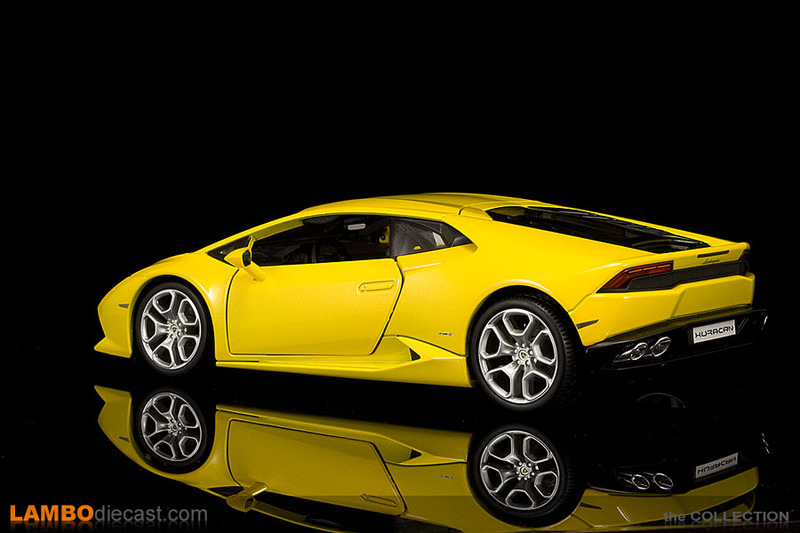 Bburago went for a chrome finish, which works on this Lamborghini so I'm not complaining about it. 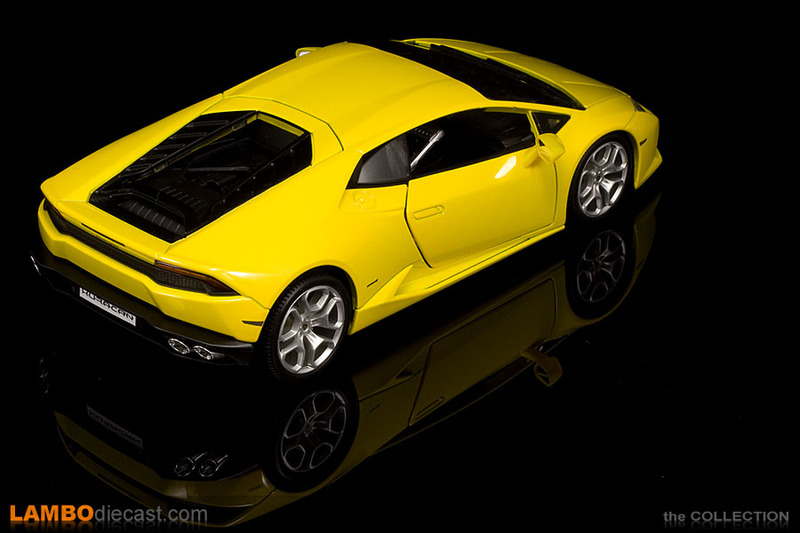 Now some might feel a bit disappointed about this Bburago 1/18 scale model of the Lamborghini Huracan LP610-4 ... but there is a catch about this specific model ... in fact it is part of a pre-series production. 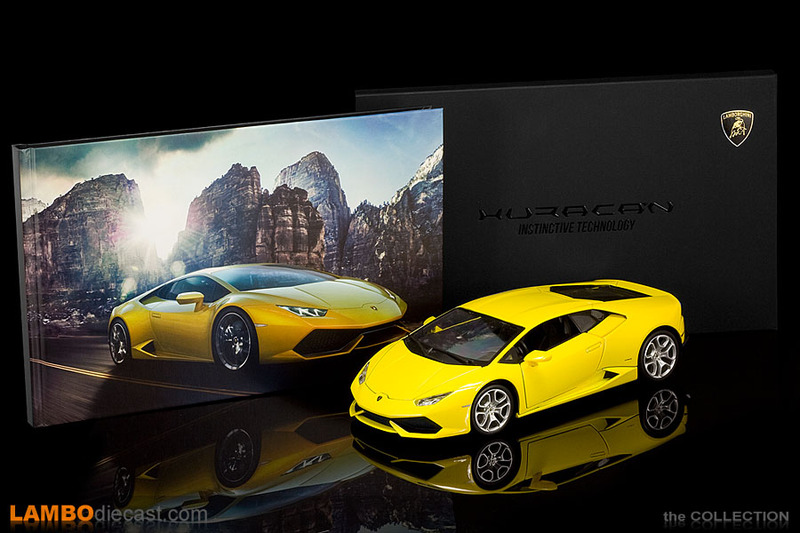 That's right, this isn't even the actual production model that will be sold from September 2014 on ... these models have been specifically made by Bburago for the 2014 Geneva Auto Show, it shows on the box in fact ... there is no 'Huracan' printed anywhere on the box, instead it shows the Lamborghini name on every side while a small decal is fitted inside the box with the name 'Lamborghini Huracan LP610-4'. Being a real pre-series model from Bburago I'm sure if there are any faults or differences to notice, most of them will be solved by the time you can actually buy these models on the regular online shops ... so in the end I'm still really, really happy with this model.